For 90 years, the people of Martin Luther Lutheran Church have been faithfully serving the children and adults of our neighborhood as we share in the Good News of Jesus Christ. Before there were public schools in our community, we taught children of all ages at our own parochial school. The people of Martin Luther partnered with the founders of the neighboring Franklin Clinic to provide a safe place for affordable healthcare. For 90 years, Martin Luther has been a gathering place for Christians to worship God, share his Word, and live out our faith together. •From the south, head north on Ann street to MLK Avenue. Martin Luther Lutheran Church is on the left. Turn left on MLK; make the next left on Cuba Street for parking. •From downtown, head west on MLK Avenue. Turn left on Cuba Street for parking. •From Pritchard, head east on MLK Avenue. Turn left on Cuba Street for parking. •A free summer math and reading academy for elementary and middle school children. Students at the summer academy do school work, share a noon meal, and go on eduational field trips in our community. •Free tutoring for elementary and middle school children in the fall, late winter, and early spring twice a week after school. •Weekly Christian worship on Sundays at 11:00 am. 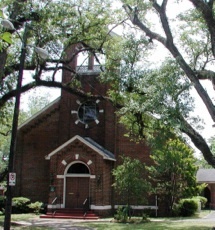 Martin Luther is a member of the Mobile Bay Lutheran Parish, a two-point congregational ministry that spans the shores of Mobile Bay. 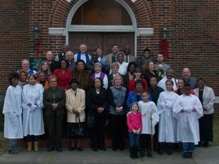 We share this partnership in ministry with Holy Trinity Lutheran Church in Daphne, Alabama.